It had been a long flight from Manchester to Cancun, packed into a Boeing Dreamliner with the package holiday crowd (at one extraordinary point the cabin had been lit up with a technicolour rainbow effect – in order, the airhostess explained – to get us in the mood for a holiday of a lifetime), and we needed to find somewhere to stay for a few days of quiet beachside relaxation that didn’t involve garish strips full of waiters offering bucket and wings deals, lobster red Brits shouting patiently in English at hotel staff, and loud, hearty Yanks shouting at each other, all in close proximity. Anywhere that wasn’t Cancun, basically. 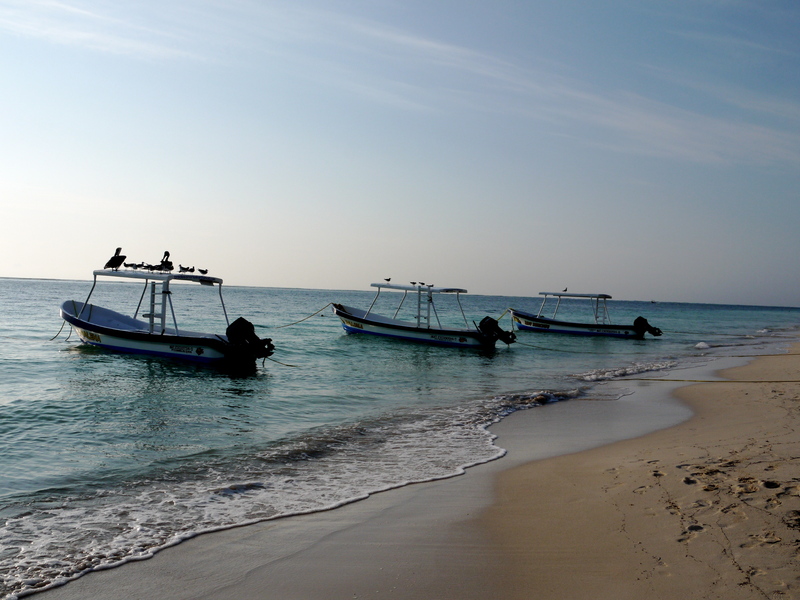 We found such a haven in Puerto Morelos, a sleepy, almost comatosed, little beach town, split down the middle by a long, dusty and largely silent avenue. Lines of palm trees waved regally towards a deserted white beach; here and there kite-surfers ducked and weaved across the frothy waves. It was the type of place favoured by a faithful flock of US retirees and sedate second-homers seeking winter sun and a chilled Sol. It was ideal for our needs. For the first time in a long time, we had no forward plans, no pressing deadlines, and no internet. A cruel cold front hovered over us shortly after we got to the tiny but immaculately decorated studio flat we’d rented a block from beach. We watched in horror as black clouds scudded over our view of paradise, as if being scrawled upon by a demonic artist with a charcoal stick. Overnight the winds emanating from the El Niño system that had already hit the USA further up-coast strengthened; and in the gale those palm trees sounded eery, like the howling of a distressed child. By the next morning the town’s lighthouse was leaning 25 degrees westward like the proverbial drunkard, but on closer inspection this had been caused by Hurricane Beulah in 1967. Having magically survived the wrath of subsequent tempests, it had been left on its precarious perch as a message of defiance from the good people of Puerto Morelos to Dios. 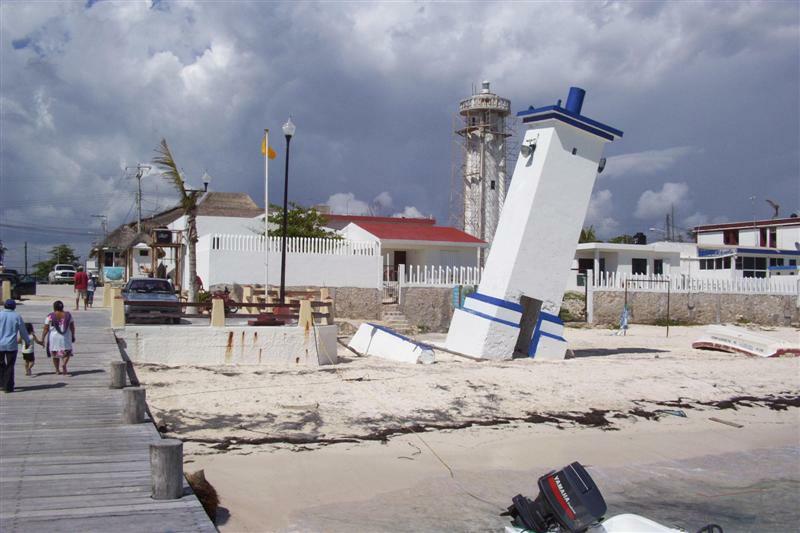 Puerto Morelos Lighthouse: used by drunken sailors to this day. I went running. It’s the best way to get your bearings in a new town. I passed some of the town’s alleged 92 restaurants on the way, hoping to get a sense of where the best places were to chow down of an evening. I was in search of (in no particular order): ceviche; enchiladas verdes; micheladas; huevos motuleños; mescal reposado and, naturally, tacos. I have talked about all these things in inordinate detail earlier in this blog, so forgive me for not re-introducing any new concepts here. They’re all utterly fantastic creations, believe me (and click on the Food sub-category to the left if you don’t). 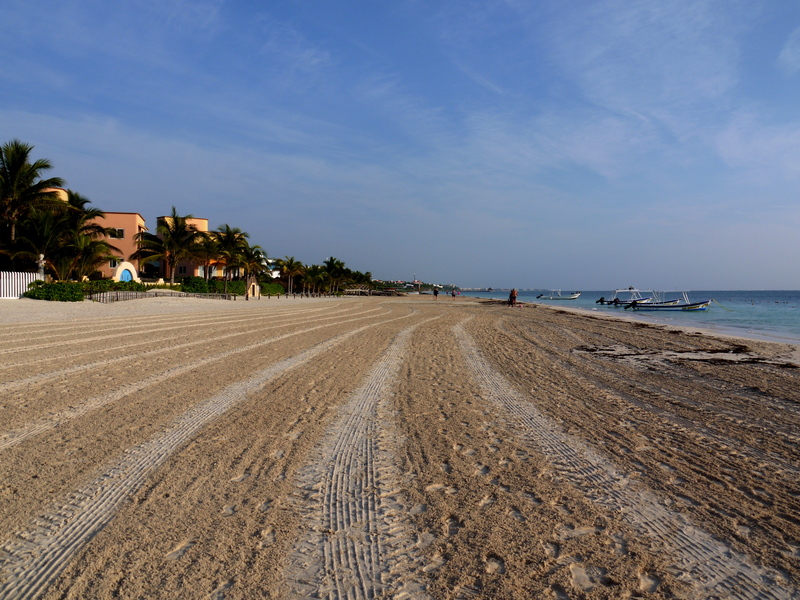 A freshly raked beach is a thing of beauty to run on. The Jehovah’s Witnesses were from South Dakota. They were friendly, unintimidating and full of Useful Local Knowledge because, hell, they’d been coming here for the last 14 years hadn’t they? Business was quiet in South Dakota, but Quintana Roo was swimming with lost souls to save. They advised us to go snorkelling. Apparently Puerto Morelos shares the best coral reefs on the Peninsula with the island of Cozumel, which we wouldn’t have time to visit. We had fantastic memories of snorkeling in the San Blas reefs so we were keen to see if Mexican waters could offer something equally special. We thanked our new religious pals, and they departed for their prayer meeting, making a no doubt well worn crack about coming to knock on our door the next morning. We hoped it was a crack, leastways. Hello, can we just read you something before you head to El Super? By noon the day after we found ourselves squeezed onto a bright blue lancha speeding up the coastline towards the resorts where rich, all-American families stay, to pick up a rich, all-American family. Gradually the hodgepodge of dark rust and mustard guest houses interspersed with white and blue Lego condos-of-the-future gave way to more purposeful developments: impressive fortresses of luxury defended by massed ranks of polite palapas, white lounge beds for the fallen and massage tents for the wounded. We picked up our family, and Pedro the captain pointed the nose of the boat towards the offshore breakers. The all-American dad mentioned loudly that the wind speed was twice the monthly average on this part of the coast, and everyone looked a little nervously at their flippers. The captain had promised the reef would be calmer, but the waves still lapped furiously at our little boat as we adjusted our goggles and jumped in. Clare’s not great in open water even when it’s calm and couldn’t tighten her goggles fully; I took a while to get the breathing thing. The all-American family were having a much worse time. Their seven year old son had never snorkeled before and this was not an illustrious start. Dad was barking orders concerning the correct way to view barracudas. The child was screaming at unknown terrors lurking just below the waves. Mom was clearly spooked and wildly appealed to her son to get a hold of himself, which I thought was pushing it. They and the guide stayed in a tight circle around the petrified child, a little human buoy of panic. Eventually we fell into the rhythm of the sea and made our way across the reef, through tentacles of brown seaweed and bright lillac plants shaped like paper fans. We spotted shoals of gently swaying flat fish decked out in yellow go-faster stripes and not much else. The second spot our guide took us to was more rewarding, and we watched brightly striped clownfish, burrowing crabs, tiny electric blue fish and even a lobster amongst the extraterrestrial coral formations. At one point a sea turtle loomed into view and then scarpered quickly. It was not quite as impressive as our technicolour snorkeling experience in Panama, but seeing such an array of sea creatures up close and personal was still mind blowing.